In response to a Saturday story from Betanews contributor Joe Wilcox, a Microsoft spokesperson told Betanews this afternoon that "the offer has not been 'pulled'" -- specifically, that it did not revoke anything with regard to its three-license Windows 7 Home Premium Family Pack offer. It simply sold out, as Microsoft says its "while supplies last" offer clearly indicated as early as last July. 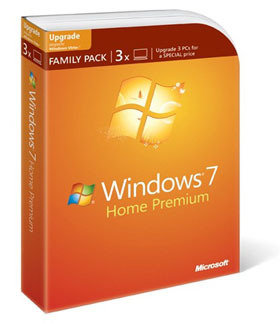 "The Windows 7 Family Pack was introduced as a limited time offer while supplies last in select geographies," the spokesperson told us. "Response has been very positive and, in some cases, the offer has sold out. Customers interested in upgrading their PCs should purchase Home Premium, Professional, or Ultimate upgrade products." One of those select geographies was apparently the Web, where the Family Pack offer was discontinued last week. "The Windows 7 Family Pack offer has ended. Please check our other offers," reads a notice on the page to which Google, Bing, and other search engines direct customers searching for the Home Premium offer. Some may wonder how much bother it would be for the company to simply print up more multiple licenses, or to keep selling downloadable editions online under a three-license deal. But that deal was a huge discount, as the single-license Home Premium upgrade edition currently sells for $119.99, and Microsoft may only have planned to absorb a limited blow from that discount. The Family Pack upgrades had sold for $150. A check of Walmart.com this afternoon showed Family Pack upgrades were still available on some store shelves, although that retailer had stopped selling the product online.